On Wednesday, 27th January 2016, His Excellency, Sheikh Fahad Abdullah Sefyan, the Ambassador of the Kingdom of Saudi Arabia hosted a dinner at his residence for members of the House Committee on Nigeria-Saudi Arabia Parliamentary Friendship Group, from the National Assembly. I was also invited. The Saudi Ambassador addressed his guests shortly before the dinner where he told them they honoured him by honouring his invitation to the dinner in his house. He thanked the Honourable Speaker, Yakubu Dogara, of the House of Representative, and his colleagues for the diligence they showed in bringing about the Friendship Group. The Ambassador reiterated the mutual benefit that this parliamentary liaison would elicit for both countries aside the cultural and commercial relations both countries already enjoy through bilateral relations. As the Committee is planning a visit to Saudi Arabia, he urged the members of the House of Representatives, who are also members of the Friendship Group, to kindly defer their visit until after the visit of His Excellency, President Muhammadu Buhari, which will hold in about 3 weeks. The request was at the instance of the leader of the Saudi Parliamentarian Delegation to Nigeria. This change in timing, according to him, will afford members of the Green Chambers the opportunity to deliberate on some of the issues the President is likely to raise during his visit to the Kingdom. On terrorism and violent extremism, Sheikh Fahad said Saudi Arabia is facing challenges on myriad fronts, exacerbated by external influences, hence the Kingdom’s intervention in Yemen with the purposes of restoring peace as well as establishing a legitimate government, and formation of the Islamic Military Alliance Against Terrorism (ISMAT). He made it clear that the Kingdom of Saudi Arabia exerts great effort in the achievement of peace and stability in all parts of the planet. He pointed out that Saudi Arabia is not alone in the fight against terror, noting that Nigeria is also involved in its own battles against violent extremism. He stressed the importance of collaboration in routing terrorist, who kill and maim the innocent in the name of a religion that abhors and severely punishes the taking of life without a just cause. Sheikh Fahad concluded by stating his desire of seeing more engaging visits between the authorities concerned in both countries in order to foster stronger bilateral relations between the Kingdom of Saudi Arabia and the Federal Republic of Nigeria. In his response, Honourable Dr. Abdullahi Balarabe Salame, Chairman Committee on Nigeria-Saudi Arabia Parliamentary Friendship Group, traced the longstanding relations between the two countries, even before the latter assumed the appellation of Kingdom of Saudi Arabia, more than two hundred years ago. He presented gift items to His Excellency, the Ambassador, including a book written by Sheikh Abdullahi Ibn Fodio, which (he), Honourable Dr Abdullahi annotated. It is in order, I suppose, to give a brief background of the Committee on Nigeria-Saudi Arabia Parliamentary Friendship Group. On Monday 25th January 2016, the House of Representatives inaugurated a 9-man committee called the Committee on Nigeria-Saudi Arabia Parliamentary Friendship Group. The Deputy Speaker, Hon. Yusuf Sulaimon Lasun, who inaugurated the committee, said the idea to create the group came when a delegation from the Shura Council of Saudi Arabia, led by Prince Khalid Abdullahi, paid him a courtesy visit to commiserate with Nigeria over the death of many of its citizens in the last Hajj. After the visit, Speaker of the House of Representatives, Yakubu Dogara, directed that the Committee be formed. The Deputy Speaker had the honour of inaugurating it. The Nigeria-Saudi Arabia Parliamentary Friendship Group was created for stronger ties and cooperation between the two legislatures. The Friendship Group, chaired by Hon. Abdullahi Barabe Salame (APC, Sokoto), is to midwife the creation of a friendship interface and expand the diplomatic space through bilateral cooperation, as encapsulated by earlier discussions with the Shura Council. The Deputy Speaker, in his speech during the inauguration, informed the gathering that the Committee was a response to the sentiments of those who attended the first meeting with the Shura Council last year. He hinted that the committee would help address several national challenges requiring bilateral cooperation and urged the members to be committed and show exemplary conduct. The Committee Chairman said the group would foster bilateral ties in trade and investments, parliamentary technical cooperation and exchange between Nigeria and Saudi Arabia as well as create a new alliance in religious and cultural sectors. The Consultative Assembly of Saudi Arabia, also known as Majlis as-Shura or Shura Council, is the formal advisory body of Saudi Arabia. It has powers to propose laws to the King and cabinet, but enactment and enforcement is left to the King. It has 150 members. It is headed by a Speaker and their role is very similar to the role of the Nigerian House of Representatives. The current speaker is Abdullah ibn Muhammad Al ash-Sheikh, in line with a tradition that kept the post in that family. The Assembly is based in the Al Yamamah Palace, Riyadh. The Saudi Consultative Assembly predates Nigeria. It started in 1924 when King Abdul Aziz arrived in Makkah. He made Shura a foundation of his government in order to fulfil the divine order by applying Shari’ah (Islamic Jurisprudence) and Shura as part of it. He intended to establish an Islamic Shura state applying Shariah as it is prescribed in the Qur'an and authentic Sunnah (deeds and teachings of Prophet Mohammad, peace be upon him). The Shura Council has witnessed a lot of changes over the years but the year 1927 is considered the actual founding date of Majlis Ash-Shura during the reign of King Abdul Aziz who inaugurated the council's first session on Sunday 17th July 1927. During the reign of King Abdul Aziz, the Council was modernised to cope with the rapid developments the country has seen in recent years in all fields, and to keep pace with the demands and requirements of modern times. This started a new page in the long history of Shura in the Kingdom of Saudi Arabia. You can visit https://www.shura.gov.sa/wps/wcm/connect/ShuraEn/ to read more about the Council. In January 2013, King Abdullah issued two royal decrees, granting women thirty seats on the council, and stating that women must always hold at least a fifth of the seats on the council. Women first joined the council in 2013, occupying thirty seats. With a 20 percent quota for women in the Shura Council, Saudi Arabia is 74th position in a list of 187 countries in terms of female representation in parliament. Notably, there is a higher percentage of women serving in the Saudi Arabian Shura council than in the U.S. Congress. This is in a country the West prefers to call 'oppressive'. The irony is somehow lost on them. Less than 10 per cent of Nigerian lawmakers are female, by the way. Any lawful and useful collaboration like this is welcome. I would love to see the two countries learn from each other in areas of mutual benefit. My only fear is that some disgruntled elements may politicise this and call it an effort to Islamise Nigeria. I hope they will remember who requested the Committee to be formed and its actual aims. I hope we are growing beyond mere rhetoric. Long Live Nigeria, Long Live the Kingdom of Saudi Arabia! The Umrah 2016 season has commenced around the last two or so months of 2015, but due to variation between the Hijrah and the Gregorian calendars, we still have to align the season to 2016. Umrah pilgrims, with the slight increase in visa for this year’s season, are trooping into the holy territories from all over the globe. 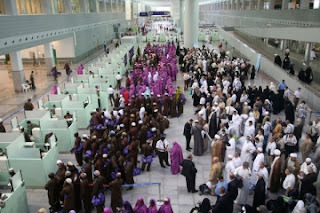 This sudden surge in the number of pilgrims is betraying some logistic challenges at the Jeddah airport. In the past Nigerians went for Umrah mostly in Ramadan, but now, all season Umrah has gained currency among Nigerian Muslims. My concern here is not on pricing of packages or the type of accommodation Umrah agents provide for their pilgrims. I am not going to speak about the high rates of visas either, (which is of course, not free). I have had occasions to write on all these issues in the past. I will not repeat myself here. I intend to share my experience in Jeddah Hajj Terminal during a recent Umrah trip I and my wife undertook as advance party to pilgrims of a new product in my company’s packages which we christened Low Season Umrah. We flew Ethiopian Airline which at the time had not commenced flights to Madeenah. Although after our return from the trip I have seen some newspaper advertisements by the airline announcing its flights to Madeenah, but at the time of our journey, Ethiopian Airline could only land in Jeddah. After landing at Jeddah pilgrims with Umrah visas have to remain seated until passengers with residence permits, visiting visas, etc have disembarked. These will board buses to the North Terminal, the main international airport, which is more orderly, organised and with a manageable crowd. Then another set of buses will approach the stationed aircraft to convey Umrah pilgrims to the Hajj Terminal which is now better in terms of infrastructure than what it was a few years ago. Entering one of the arrival halls at the Hajj Terminal I noticed that the crowd was as large as you witnessed at the peak of Hajj seasons. Pilgrims grouped together according to their arrival time, region and flight details. Here, the wait was endless; until the long queues at the Passport Control abated there was nothing one could do to hasten their movement to the next level of airport formalities. At the Passport Control which in the Hajj Terminal covers a vast expanse of space with numberless booths for stamping of passports and recording of thump print of pilgrims. The whole area was flooded with queues of pilgrims waiting patiently for their passports to be stamped, their fingerprints and pictures captured. Not all countries are subjected to fingerprint and image capture at the point of entry into Saudi Arabia or other Gulf countries like Dubai (where ‘iris scan’ is used in place of fingerprints capture). Only pilgrims from some countries which include Pakistan, Niger, Nigeria, Ghana, Bangladesh, etc undergo such scrutiny. A regular traveller to Saudi Arabia knows the reason for subjecting pilgrims from these countries to this extra verifications and checks. That is not the purpose of this article. Luggage Claim is another hurdle after the near lifelong time spent at arrivals and passport control. The place is in total chaos to put it mildly. Pilgrims’ Baggages of diverse hues littered the whole section of the Luggage Claim. You will start your ‘tawaaf’ here by moving from one luggage carousel to another. You will not see your bags. All baggages, unless they were tagged as ‘Umrah’ from the point of check in, were taken to the North Terminal. That was what happened to us. From Abuja Ethiopian Airline did not attach any ‘Umrah’ stickers to our baggages, thus we could not see them at the Hajj Terminal. 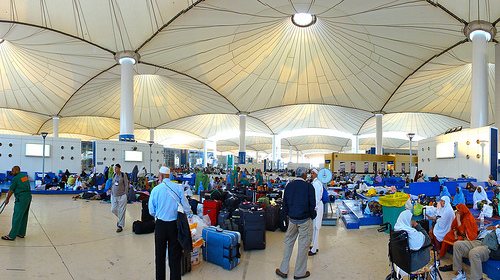 We had to complain to a designated office for the purpose at the airport, and after several followups spanning hours, the luggages were finally sorted out at the North Terminal, separating what was left of the baggage of the passengers with visas other than the Umrah, before sending them to the Hajj Terminal. The Saudi government stipulates that all Umrah passengers’ luggage must be tagged as such. Not doing so is wrong and in breach of the law. It should attract a sanction against the offending airline. People waste a lot of their productive time looking for their bags; bags which were misplaced due to the negligence of an airline. We landed at Jeddah around 3am, but due to what I enumerated above, we left the airport around 8:30am. There were cases of pilgrims who left hours later than us. Another problem at the Hajj Terminal is that of transport out of the airport. No taxi is allowed; no buses for public transport; nothing. For obvious reasons the Hajj Terminal is the much guarded of all airports in the Kingdom. This is commendable. But there should flexibility without relaxing security in order to ease the hardship of pilgrims for whose benefit all these safeguards are implemented. There are taxis (of cars and buses) in the North Terminal. Passengers can move easily out of the airport to any destination around the Kingdom. In the Hajj Terminal you have to use assigned buses to Umrah companies, the same buses that transport pilgrims during Hajj, with all the inconveniences peculiar to them - of having another session of waiting for enough pilgrims to fill a 49 seater bus, with almost every other person going to a different hotel in Makkah, among other inconveniences. The only alternative out of the Hajj Terminal is paying SAR100 to private car owners (kabu kabu), with attendant risks, to take you to the gate; a drive of about five minutes only. Some of them will ask for more that 100 riyals. These car owners are nationals who have gate passes for entry into the airport. No other persons are allowed except passengers with valid travel documents including a ticket for a flight leaving on the day of entrance, otherwise they are denied entry. We support the initiatives of the Royal Kingdom in expanding the Haramayn and in many other projects aimed at easing the performance of Hajj and Umrah for Allah’s guests. But ease should start from the time the pilgrims arrives the airport to the time that they will leave the airport again after finishing their devotions. The Saudi authorities, therefore, will do better by making arrival and exit formalities in the Hajj Terminal less cumbersome than they currently are for the Umrah pilgrims. Until the changes are made by the Saudi authorities, I will suggest to anyone who wants to perform Umrah to choose an airline which plies the Madeenah route. Airlines like Emirates, Etihad, Egypt Air, Ethiopian Airline (twice a week for now), Saudi Airline and Turkish Airlines will land in Madeenah. Even if you will stay in Makkah, you will find it worth your while to land in Madeenah for now. I know the Saudi government will listen and see reason; unlike what some uncharitable columnists have written to downplay and deny their great efforts. May Allah accept our worship and may He make the changes easy to implement for the government. Subsequently, the special committee held its first meeting at the office of the Secretary General, NSCIA, Professor Is-haq Oloyede. At that meeting, the Committee agreed on a number of issues. Part of the issues was to write to seek audience with the Chief of Army Staff (COAS) and to copy other stakeholders in the maintenance of law and order. The letters would urge them to use their good offices to arrange a meeting of the Special Committee and Sheikh Ibrahim El-Zakzaky, who was said to be in the custody of the Nigerian Army at that time. The letters were dispatched on Thursday 17th December 2015. Although notice of at least twenty-four hours was advised in the letters as time required to assemble the committee members who are located in different parts of the country, the office of the Chief of Army Staff, hoping that members were still in Abuja, called to convey the COAS’s readiness to receive the committee by 4:15pm that very day. Prof. Dawud O.S Noibi, Chairman of the Committee, Prof. Is-haq Oloyede, Secretary General, NSCIA, Muzzammil Sani Hanga, Mr Femi Abbas, Sheikh Abdur Rahman Ahmad and Abubakr Siddeeq Muhammad. Lieutenant General TY Buratai, COAS, Major General LKJ Ogunewe, Chief of Policy and Plans, Major General AA Salihu, Chief of Logistics, Major General AB Abubakar, Chief of Administration, Brigadier General ASH Sa’ad, Brigadier General AT Hamman, Provost Marshal, and Colonel (now Brigadier General) KO Aligbe, Principal Staff Officer to COAS. In his opening remarks, Prof. Noibi intimated the gathering on the purpose of this Special Committee which is to verify the veracity of information making the rounds in the media ‘concerning the events of last Saturday’. He said as Muslims we should not form opinions on hearsay or unsubstantiated rumour (al-Hujuraat, 49:6). He also said that the duty of NSCIA is to offer counsel on what needs to be done to douse tension, maintain peace, and guarantee fair treatment for all. He concluded by reiterating the Committee’s desire to have access to the leader of the other group, Sheikh Ibrahim El-Zakzaky. The Chief of Army Staff, Lieutenant General TY Buratai responded by appreciating the concern of NSCIA ‘in this avoidable incident’. According to him, everybody can exercise their freedom of association and assemblage as Nigerians without infringing ‘on other citizen’s rights’. He pointed out that the Army as an institution has the constitutional responsibility of bringing any situation capable of threatening peace under control. The Muslim group under the aegis of Sheikh El-Zakzaky, to his mind, took the law into its hand, and acted as an authority unto itself. He said they blocked the road and when officers travelling with him tried to plead for a passage for him and his convoy, the group was deaf to all entreaties. Lieutenant General Buratai also hinted at the fact that most of the officers at the meeting were with him during the incident as well as personnel of the DSS and members of the press. He stated that it was only after the first gunshot by the Islamic Movement group that his convoy had to force its way into the blockade, acting, in the process, ‘according to the rules of engagement’. The gunshot, he said, occasioned the ‘cordon and search operation’ by the Army in collaboration with other security agencies on Sheikh El-Zakzaky’s residence and the group’s shrine in order to recover arms and weapons the existence of which was established by intelligence reports. The Chief of Army Staff said at the end of the discussion a video clip would be shown to members, which will help them dispel false images and videos on the social media, and to asses for themselves the level of provocation by the Muslim group that his convoy was confronted with. On Sheikh El-Zakzaky, Buratai said the Army is not against him as a person, but that nobody should be allowed to take the law into their own hands; law and order, he said must be maintained by all means necessary. Sheikh El-Zakzaky, he concluded, ‘has been handed over to the appropriate authority’; therefore, the Committee could seek to meet with him from the relevant agency. The officers drew attention of the meeting to some scenes in the video where some people were holding gallons containing what seemed to be inflammable liquids, moving further away from the epicentre of the crisis, as if they were trying to encircle the convoy of the COAS. Then suddenly the whole place was empty except for the Army vehicles in the COAS convoy. Doubtless, the video, at that point, was subjected to editing. The Committee raised the issue on how the road was deserted; the answer was that the Army had to clear the road, after the gunshot from the Islamic Movement group, ‘with minimum force’; that during the shootings, all the cameramen had to be in the cars and stop filming. Other questions from the Committee members were: What are you doing to deescalate the crisis? What is the actual number of the dead, and when are they going to be handed over to their relatives for proper burial? Are the injured receiving adequate treatment? Why is the Army not doing much in information dissemination in order educate the public on the vital issues presented to us today? The incident was regrettable; individuals and groups must realise that exercising your human rights ends where that of others starts. A gunshot was heard during the standoff between the convoy of COAS and the El-Zakzaky group. It was after this gunshot that the soldiers had to react after exercising a lot of restraint. Forestalling further escalation of violence became necessary due to the gunshot episode which necessitated the cordon and search on the Husainiyyah shrines. Before the commencement of the operation, contact was established with El-Zakzaky to surrender both himself and the arms under his charge but he remained obdurate; and repeated public announcements were made urging people in the vicinity to leave the area, and return only when it is over. While many heeded the call, some, especially the votaries at Husainiyyah, decided to remain behind. Investigations revealed that not all Shiites are in support of El-Zakzaky’s modus operandi in propagating his ideology. Many of them do not accept most of what the Islamic Movement of Nigeria does, thus, rather than call them Shiites, the army chose to christen them members of the Islamic Movement of Nigeria, as they describe themselves. Those who know these facts could convey them to those who do not. People may be more receptive to the story if it was told by a neutral party to the crisis. I will conclude by appealing to all parties to exercise restraint, and eschew escalating the crisis by words or deeds capable of inflaming an already heightened tension over this ‘avoidable incident’. Let us allow the Nigerian Supreme Council for Islamic Affairs, under the leadership of His Eminence, the Sultan of Sokoto, Alhaji Muhammad Sa’ad Abubakar CFR, mni, mitigate this matter. Other bodies working towards this goal include the National Human Rights Commission, and the Kaduna State Government. Let us all ‘give peace a chance’!